Microsoft introduced to the public its latest development tool last Tuesday, which is designed for new programmers who in one way or another might be interested to build up their own Windows Phone apps. This is line with the company’s commitment to provide quality technological innovations in this regard to the delight of app lovers from all over the world. The Microsoft-developed tool is totally different from the previous development tools or projects, as stressed by the company’s spokesperson. 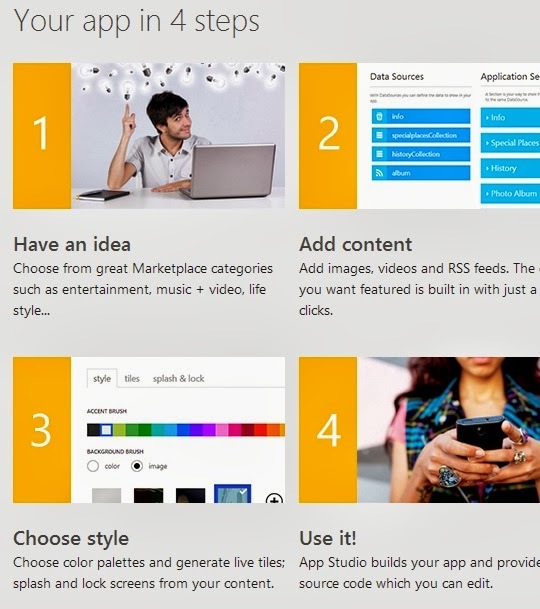 Called the Windows Phone App Studio, this free tool is a web-based app creation intended to assist anyone to make their concepts in mind realized by applying the text, imagery, web content and design to any of the customizable available templates. This tool is indeed very easy to operate that even if you are not really adept on the technical aspect, still you can do it with aplomb. Simply create a Microsoft account then choose the template you want to use and start adding content to it. Once everything is set, Windows Phone App Studio takes charge of the other things. And when your app is finally done, you can easily download such app to your own business phone or you may share it with other people by making it public through the Windows Phone Store. As you can see, Windows Phone App Studio is user-friendly so you have nothing to worry as far as maneuvering such tool is concerned. Even modifying an app is an easy task. This latest dev tool is better than the previous version which is optimized for the IE10 and has only a limited number of templates to choose from. It is very promising that the company has already in mind an upgrading in the future as regards its capabilities to attract more users. Microsoft really hopes to achieve a remarkable growth in their Windows Phone application base. That is why their research and development department keeps on looking for ways to make this goal become a reality. And their Windows Phone App Studio serves as one of their arsenals in this regard. Presently, it has an approximately 160,000 apps and hoping to produce more to further strengthen its status and establish strong dominance in the industry. At any rate, it can’t be denied that there’s still the never-ending app-gap among iPhone, Android Phone and Windows Phone according to Nick Landry, Infragistics current Senior Program Manager and the Most Valuable Player (MVP) in the Windows Phone Development. But Landry argues the enormity of the situation as what some experts believe to have transpired, prompting many app users to ignore the Windows Phone Application Base. Landry made a comparison of the three phone platforms as to the availability of the 100 top phone apps. His findings clearly emphasized that it’s just a measure of the official app availability of these platforms. All of Landry’s self-selected top 100 phone apps run on iOS and almost all of these also run on Android too but only 63 percent are applicable on Windows Phone. This only shows that the latter still needs to catch up with the other two platforms to ensure public support. Windows Phone App Studio is not really intended at developers of the sort of apps that Landry have measured. Nevertheless Microsoft is actually hoping that this dev tool might appeal to those who have great concepts for apps, though not necessarily the type of programming background as well as the competence to turn these ideas into full apps. The company is very optimistic that their latest offering will create wonders for them.